Fatherhood in the twenty-first century is not for the faint-hearted, but it isnt rocket science, and there arent any tricks. A seasoned father shows that any man with common sense, an unwavering focus on his goal, and the willingness to struggle can raise a great family. 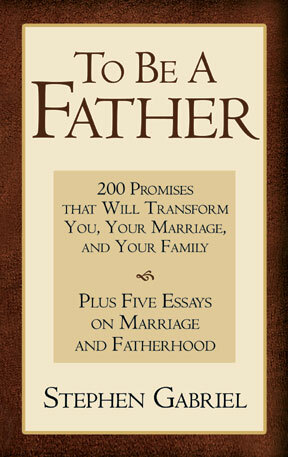 To Be a Father challenges men to make the demanding commitments that will transform their family lives and themselves. Promises to My Wife offers a husbands commitment to romance and the shared responsibilities of the family; Promises to My Children addresses religion, discipline, and family living, as well as just plain fatherly love; Promises to Myself encompasses goals for the family, spirituality, and community life. "Today's men have very few resources to provide them with good guidance for their roles as husbands and fathers. Thankfully, To Be A Father is one such resource; it provides a clear, compelling, and cogent roadmap for successfully navigating the challenges of marriage and fatherhood. Stephen Gabriel's aphorisms are priceless, as are his essays on family life. This is a book men should read carefully, and with their wives and children close at hand."